Ukrainian President Petro Poroshenko has dismissed Oleksandr Horin from the post of Ukrainian Ambassador to the Netherlands and the post of permanent representative of Ukraine in the Organisation for the Prohibition of Chemical Weapons (OPCW, held the post concurrently). 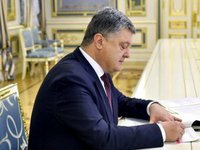 The decree dated March 17, 2017 was posted on the website of the Ukrainian president. The president appointed Vsevolod Chentsov Ukrainian Ambassador to the Netherlands. Chentsov, born in 1974, is a diplomat. He has been working in the Foreign Ministry of Ukraine since 1996. We worked in the Ukrainian embassies in Turkey and Poland, and the Mission of Ukraine to the European Union. He headed the EU department in the Foreign Ministry of Ukraine.